Performers include: Fred Armisen, Dan Aykroyd, Peter Aykroyd, Morwenna Banks, Jim Belushi, John Belushi, Jim Breuer, Whitney Brown, Beth Cahill, Dana Carvey, Chevy Chase, Ellen Cleghorne, George Coe, Billy Crystal, Jane Curtin, Joan Cusack, Denny Dillon, Jim Downey, Robert Downey Jr., Brian Doyle-Murray, Robin Duke, Nora Dunn, Rachel Dratch, Christine Ebersole, Dean Edwards, Chris Elliott, Jimmy Fallon, Siobhan Fallon, Chris Farley, Will Ferrell, Tina Fey, Will Forte, Al Franken, Janeane Garofalo, Ana Gasteyer, Gilbert Gottfried, Mary Gross, Bill Hader, Anthony Michael Hall, Brad Hall, Rich Hall, Darrell Hammond, Phil Hartman, Jan Hooks, Yvonne Hudson, Melanie Hutsell, Victoria Jackson, Tim Kazurinsky, Chris Kattan, Laura Kightlinger, David Koechner, Gary Kroege, Matthew Laurance, Julia Louis-Dreyfus, Jon Lovitz, Norm MacDonald, Gail Matthius, Michael McKean, Mark McKinney, Tim Meadows, Laurie Metcalf, Seth Meyers, Dennis Miller, Jerry Minor, Finesse Mitchell, Jay Mohr, Tracy Morgan, Garrett Morris, Eddie Murphy, Bill Murray, Mike Myers, Kevin Nealon, Laraine Newman, Don Novello, Michael O’Donoghue, Cheri Oteri, Chris Parnell, Joe Piscopo, Amy Poehler, Emily Prager, Randy Quaid, Colin Quinn, Gilda Radner, Jeff Richards, Rob Riggle, Ann Risley, Chris Rock, Charles Rocket, Tony Rosato, Maya Rudolph, Andy Samberg, Adam Sandler, Horatio Sanz, Tom Schiller, Rob Schneider, Paul Shaffer, Molly Shannon, Harry Shearer, Martin Short, Sarah Silverman, Robert Smigel, David Spade, Pamela Stephenson, Ben Stiller, Jason Sudeikis, Julia Sweeney, Terry Sweeney, Kenan Thompson, Danitra Vance, Dan Vitale, Nancy Walls, Damon Wayans, Patrick Weathers, Kristen Wiig, Fred Wolf, and Alan Zweibel. Series Description: Created by Lorne Michaels, this weekly late-night comedy show features sketches by a regular cast of diverse performers, a guest host and a musical guest. Cast members both write and perform in the show and episodes are aired live on the East Coast. 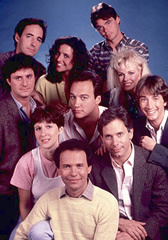 Ongoing and notable sketches include The Blues Brothers, Celebrity Jeopardy!, Church Chat, Coffee Talk with Linda Richman, The Coneheads, Daily Affirmation with Stuart Smalley, Deep Thoughts by Jack Handey, Fernando’s Hideaway, Hans and Franz, Master Thespian, Mr. Bill, Mister Robinson’s Neighborhood, Pat, The Pat Stevens Show, The Sweeney Sisters, Tommy Flanagan, The Pathological Liar, and Wayne’s World. Many SNL sketches have also been the basis for over a dozen feature films. The series is still in production. 2009 TV Land Awards Spotlight M*A*S*H, Married with Children, ER, Home Improvement, Magnum PI, Knots Landing, and more! Seinfeld: A New Cast Reunion?